Photo: H. Grunert / www.nobelprize.org. The Winter 2000 issue of WLT featured “To Be Continued . . .”, the English translation of Grass’s 1999 Nobel Prize lecture, and his watercolor painting Fruit Grove in Winter on the cover (1996, © Steidl Verlag). 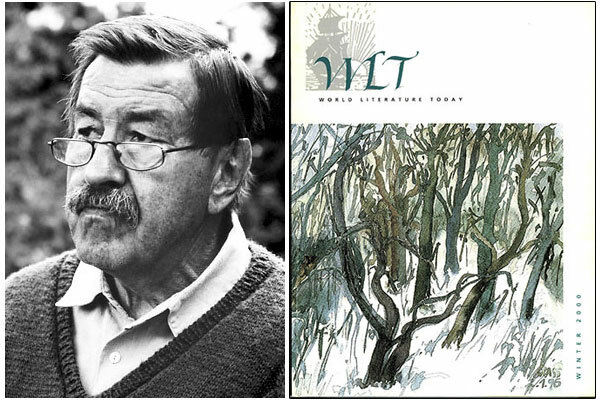 When it was announced on Monday that Nobel laureate Günter Grass had passed away in Lübeck, Germany, at the age of eighty-seven, we asked longtime WLT contributor Theodore Ziolkowski to offer a few words of tribute. The following is Dr. Ziolkowski’s earlier essay on Grass, written shortly after the German writer won the Nobel Prize in 1999. This remarkable scene, which parallels other encounters of authors with their fictional creations from Unamuno’s Mist to Kurt Vonnegut’s Breakfast of Champions, hints with delicious irony at a relationship going well beyond those represented by Unamuno and Vonnegut. Grass, like few other writers, has been identified in the minds of many readers almost wholly with his great first novel. When the Swedish Academy announced the awarding of the 1999 Nobel Prize in Literature to Grass, it singled out The Tin Drum for ushering in a new era for German literature: “It is not too audacious to assume that The Tin Drum will become one of the enduring literary works of the 20th century.” Certainly that masterpiece, which has sold more than four million copies worldwide, deserves its fame. Grass created a narrative standpoint absurd enough to come to grips with the often terrifying history of Germany in the first half of the twentieth century. Oskar Matzerath, reluctant to participate in the world into which he was born, at age three hurls himself down a cellar staircase and injures himself in such a manner that he remains an outsider with the body of a child, able to observe reality from his picaresque perspective (looking up from below and often unnoticed) and, at the same time, capable of influencing events through the magical power of his tin drum and his glass-shattering voice. All this publicity, symbolized by Grass’s appearance on the cover of the German newsweekly Der Spiegel in September 1963, simply underscored the significance of his first novel and the identification of the author with that work, which has been acclaimed by admirers as the greatest novel by any living writer or even of the twentieth century. A recent issue of Der Spiegel (11 October 1999) dedicated to young writers in Germany reiterated the influence of Grass’s novel by depicting on its cover six “grandchildren of Grass & Co.” clutching tin drums. Further millions who did not read the novel have become acquainted with Oskar’s story in Volker Schlöndorff’s prizewinning film adaptation (1979). Critics and the reviewers of his subsequent works have often expressed their disappointment and frustration at the fact that Grass has not simply repeated that virtuoso debut by, in effect, writing another Tin Drum. Small wonder, then, that Oskar Matzerath suspects in 1986 that his creator is toying with the idea of doing away with him. For the deformed and morally evasive narrator of The Tin Drum, however timely he may have been as a spokesman for the Grass of the fifties, cannot possibly exhaust the exuberant genius of Grass’s forty-year career. Only weeks before the Nobel Prize was announced, Grass published his most recent fiction, titled My Century (Ger. Mein Jahrhundert), in which each year is typified in one of an even hundred brief (roughly three-page) “annual episodes” portraying German history “from below.” The first recounts, for instance, from the standpoint of a German soldier the European expedition to put down the Boxer Rebellion in China; in 1910 the wife of an armament factory worker recalls how one of the products was named “Big Bertha” after her; another narrator works for the firm that provided the glass cage in which Eichmann stood trial in Jerusalem; the entry for 1970 depicts, with an accompanying illustration by Grass, the moving occasion when Willy Brandt spontaneously fell to his knees before the memorial to the victims of the Warsaw Ghetto; and in the 1999 episode Grass resurrects his own deceased mother to reflect on her (and his) life and to celebrate her 103rd birthday. While few readers would argue that the language of these straightforward accounts can compete with the outrageous energy of The Tin Drum, the enterprise is revealing: far from limiting himself to the half-century encompassed by The Tin Drum (1899–1954), Grass announces his intention to reclaim the whole twentieth century in an imaginative coup, and not just the years immediately surrounding the Nazi era. Yet even this bold project fails to exhaust the historical sweep of Grass’s fiction. In The Thunder (1977) Grass widens his fictional focus to encompass in a dozen episodes the history of the Baltic basin from its earliest Neolithic inhabitants to the feminists of the 1970s. In The Rat he presents us not only with an apocryphal view of that same topography in the “post-human” period following a nuclear holocaust, when the world is inhabited solely by rats; but in a weird time-warp that Grass calls “Vergegenkunft” (pastpresenture), he also seeks to show how the past and future are always implicit in the present, and the imaginative in the real, by depicting a contemporary Germany in which the chancellor and his children interact not only with the historical Grimm brothers but also with the figures from their best-loved fairy tales. The locale in Grass’s fictions is almost always his native Danzig (the present-day Gdańsk) and the Baltic rim: not only in the so-called Danzig Trilogy encompassing the three closely related early works The Tin Drum, Cat and Mouse (1961), and Dog Years (1963), but also in most of the later novels. In Local Anaesthetic (1969) the narrating high-school teacher is sitting in a dentist’s chair in Berlin of the late 1960s and thinking about his students, but in his thoughts he returns time and again to his youth in Danzig, where as leader of a gang of teenagers he also knew Oskar Matzerath. From the Diary of a Snail (1972) combines an autobiographical account of Grass’s 1969 campaign efforts on behalf of Willy Brandt and the Social Democratic Party with the (fictional) story of a Danzig high-school teacher who, for his efforts on behalf of the Jews, is persecuted by the Nazis and forced to go into hiding during the war years. The Flounder amounts to a fictionalized history of Danzig and The Rat to an apocryphal projection of its future, while The Call of the Toad (1992) takes place in present-day Danzig, where, in a wild travesty of the postcommunist diplomatic dilemma, an elderly German widower and a Polish widow found the enormously successful German-Polish Cemetery Association to repatriate the bodies of former Danzigers who died in exile. Grass writes with compelling authority about the German experiences of the 20th century because his own participation during the crucial formative years was typical. Only a few shorter works are set elsewhere: The Meeting at Telgte (1979) takes place in Westphalia on the border between Protestant and Catholic Germany during the Thirty Years War; in Headbirths (1980) Grass reported on the trip to India that he and his wife had recently undertaken; and in My Century he imagines himself, like the hero/heroine of Virginia Woolf’s Orlando, moving through time and space in a variety of metamorphoses. As these examples suggest, the subject matter of Grass’s fiction is to a conspicuous extent autobiographical. Grass writes with compelling authority about the German experiences of this century because his own participation during the crucial formative years was typical: “At fourteen I was a Hitler Youth, at sixteen a soldier, and at seventeen an American prisoner of war.” He points out that he was too young to have been a Nazi but old enough to have been molded by a system that scandalized the world. He is convinced, as he again stressed in his Nobel Prize lecture, that German writing, after “the irreparable breach in the history of civilization” represented by Auschwitz, could justify itself only by internalizing the past so thoroughly that it could never be forgotten. However, except in a few straightforward autobiographical accounts, such as his campaign activities in From the Diary of a Snail, the material is always imaginatively transformed. Thus Oskar, in The Tin Drum, repeats many of Grass’s own experiences in the immediate postwar world—attending school in Düsseldorf, apprenticing as a stonemason, working at the Art Academy (albeit as a model, not a student), playing drums in a jazz trio (Grass played the washboard)—but Oskar’s dwarfish perspective utterly defamiliarizes the material. Elsewhere Grass makes use of conjectural biographies, as in The Meeting at Telgte, where he projects himself and his friends from Gruppe 47 some three hundred years into the past. From the Diary of a Snail conflates fiction, autobiography, politics, and historical reality in a mélange that culminates in a brilliant essay on Dürer’s Melencolia I. In The Flounder, which matches for sheer gusto the conception and prose of The Tin Drum, the history of Danzig is recounted by a narrator who moves through the centuries, always associated with one of a dozen women who represent through their lives and their cooking the epochs of human development—from the semidivine matriarch of the Neolithic Age through medieval nuns down to the feminists of the 1970s—and with extensive recipes for the foods that reflect the history of human nourishment. His story is further complicated by the fact that he chats with and is advised through the ages by a fish—the talking flounder from the Grimms’ fairy tale of the fisherman and his wife—which is finally caught in the 1970s by a group of feminists who put it on trial before a feminist tribunal in Berlin for having aided and abetted a patriarchal hegemony from the beginning of time. In The Meeting at Telgte Grass imagines a meeting of Gruppe 47 projected back into the year 1647: the historical situation of the Thirty Years’ War provides the analogy to the postwar period in Grass’s Germany, and the writers of the German Baroque provide ample possibilities for a roman à clef involving the most prominent writers of contemporary German literature. Headbirths estranges Grass’s own trip to India with his wife by juxtaposing it to the imagined trip of another young German couple to the same country. As these topics suggest, Grass has been politically active and socially engaged for much of his career. In 1966, one year after he first campaigned for the Social Democratic Party, Grass gave an address at Princeton at a joint conference of American and German writers on the role of the writer in modern society. Poking gentle fun at those writers and intellectuals who incessantly call for proclamations and petitions for or against various causes, Grass points out that society poses problems that cannot be solved by position statements and petitions alone. Rejecting any aspiration to represent “the conscience of the nation,” he urges participation in the nitty-gritty (Ger. Kleinkram) of the democratic process. But unlike literature, he warns, politics requires compromises. Grass was arguing in that speech for a clear-cut distinction between the absoluteness of literature and the contingency of politics, between the separate roles of the individual as writer and as citizen. Accordingly, in the scores of political essays that he composed in the following decades—from 1970 to 1972 he contributed a biweekly political column to the Süddeutsche Zeitung—and in the hundreds of campaign speeches that he delivered for the SPD in the election campaigns from 1965 to 1980, Grass repeatedly stressed that he was speaking as a citizen and not from any imagined position of privileged insight as a writer. He realized, of course, that his celebrity attracted his large audiences; but he sought to persuade his fellow citizens from a standpoint of democratic equality. Above all, he wanted to dissociate himself from what, in another essay, he called the “intellectual sorcerer’s apprentices”—that is, the intellectual elites motivated by ideologies of the Left or Right. His most powerful literary statement of this principle was the play The Plebeians Rehearse the Uprising (1966), which is based loosely on Bertolt Brecht’s refusal to take an active part in the 1953 uprising of the workers in Berlin. But Grass takes that incident as an occasion to pillory all intellectuals who articulate ideological positions and yet refuse to take an active part in political action. His attack on ideologies, in turn, informs the satirizing portrayals of such thinkers as Hegel (in The Flounder) and Heidegger (in Dog Years). At the same time, as a skeptical realist Grass realizes that his own reasoning doubts cannot always influence younger generations, who often regard him as a “dinosaur.” His fictional reaction to the violent excesses among students in the later 1960s was reflected in Local Anaesthetic, in which the forty-year-old teacher fails to persuade his student through rational arguments to give up his violent protests against the war in Vietnam. When the student finally does desist, he does so, paradoxically, because he wants to avoid, when he himself is forty years old, the fate of his teacher, who is so utterly obsessed with the adventures of his own youth in Danzig that he cannot engage himself fully in the present. As Grass remarked in his Nobel Prize lecture, it is literature’s most grievous offense in the eyes of those in power that it takes up the cause not of history’s victors but of the losers standing at the edge of the historical process. The anti-Grass crusade reached its nadir, however, with the campaign against his most recent novel, Too Far Afield (1995; Ger. Ein weites Feld), in which Grass gave fictional expression to his views on German reunification, distancing them through the collective narrative voice of “We from the archive” (as a satire on the depersonalization of life in societies regimented by the impersonal institutions of politics and economics). Spearheaded by Marcel Reich-Ranicki, Germany’s so-called literature-pope, in a cover piece in Der Spiegel, the attacks were aimed at Grass’s critical attitude toward the takeover of East Germany by the Federal Republic and, in particular, the Treuhandanstalt (Treuhand or True-Hand Commission), the institution charged with the privatization of former GDR properties and businesses. Focusing on the political implications, which again provide only the background of the novel and not its substance, West German critics tended to ignore its immense literary achievement and to dismiss it as political hackwork. Readers in the former GDR, in contrast, found Grass’s depiction of conditions there much fairer, while reviewers outside Germany have often praised the novel on literary grounds as a match for The Tin Drum. It is Grass’s achievement that he is able to represent and give equal weight to all opposing points of view, regardless of his own political views: The Tin Drum portrays with the same vividness the horrors of National Socialism and the appeal of the Nazis to lower-middle-class Germans; The Flounder respects and simultaneously ironizes the views and achievements of feminists. At the same time, in its formal experimentation the novel reflects the bold complexities of the twentieth-century German writer whom Grass has repeatedly called his teacher: Alfred Döblin, the author of Berlin Alexanderplatz, in whose name Grass donated his house at Wewelsfleth in 1985 as a center for young writers. A sophisticated awareness of the formal potentialities of modern fiction is apparent in the opening pages of The Tin Drum, as Oskar debates the various ways of telling his story. “You can begin a story in the middle and create confusion by striking out boldly forwards and backwards,” he reflects. “You can act modern, smooth away all times and distances and subsequently proclaim, or have proclaimed, that you have finally solved the time-space problem.” (That is precisely what Grass self-ironizingly achieved in the “pastpresenture” of Headbirths and The Rat.) It is in this connection that the odd form of From the Diary of a Snail has not always been fully appreciated in its mixture of autobiography, history, fiction, and art criticism. In a 1991 interview Grass remarked that he regarded it as, in many senses, his boldest formal experiment, without which he could never have written such later works as The Flounder. Grass succeeded with incessant inventiveness and without self-repetition in stamping his artistic imprint on the century that he has documented so unforgettably. Does any other writer have equal claim to the last Nobel Prize of the twentieth century? Readers who approach Grass’s most recent novel as a literary rather than a political statement cannot fail to appreciate its imaginative power. While Too Far Afield is on one level a critique of the consequences of the 1990 reunification of Germany, that critique is achieved by means of a startling literary technique: a sustained analogy between the history of Germany in the twentieth century and the nineteenth century. This effect is achieved by means of one of the two central figures, Theodore Wuttke, who, because of his obsession with the great nineteenth-century novelist Theodor Fontane, is known to his friends as Fonty. As Fonty’s life is revealed—from his birth in 1919 precisely on the hundredth anniversary of Fontane’s birth and in the same town of Neuruppin, through the Nazi years and his work as a cultural lecturer in the German Democratic Republic, down to his current position as a messenger in the Treuhandanstalt—we are constantly reminded of parallels in Fontane’s life, times, and works, signaled by the title of Grass’s work in German, Ein weites Feld, which is a familiar phrase from Fontane’s novel Effi Briest. Fonty is of course ready on every occasion with an appropriate quotation from Fontane’s works. This technique of fictional postfiguration—used, for instance, also in Thomas Mann’s Doktor Faustus—enables Grass to suggest larger patterns in German history and, specifically, to enlist Fontane’s reservations about Bismarck’s unification of Germany in the service of his own critique of the 1990 reunification. But—and this must be stressed—it is first and foremost a critique by literary, not by political means. Grass is using the political materials in the service of fiction and not forcing fiction into the Procrustean bed of politics. It seems reductive, therefore, to judge Grass’s works from a political standpoint, for it is difficult to think of any other twentieth-century writer who has manifested such a universal interest in capturing life and history with all available means of expression. In addition to his typewriter, the tools of his graphic art, and the washboard of his early music-making, for instance, Grass has also chosen to express himself with the implements of the kitchen. From his early ballet Five Cooks (1959) and the play The Wicked Cooks (1961), Grass has been obsessed with cooking: “cuisine” would be too elegant a designation for the earthy ingredients that he prefers, including leg of mutton and lentils, calf’s kidneys on celeriac, green eel, tripe, mussels, suckling pig, fish and mushroom soups, and minced lung. In those same years he also turned out many drawings of cooks: “A Grouping of Cooks,” “Seven Cooks,” “Small Cook,” “Self-Portrait as Cook,” and others. In From the Diary of a Snail he imagines that he might someday purchase one of the small churches standing empty all over Berlin and transform it into an inn “At the Sign of the Holy Ghost,” where he would prepare all his favorite foods, which betray the same earthy quality as his prose. In that same work he expresses the wish, before he becomes old and wise, to write a “narrative cookbook” including over ninety-nine recipes and dealing also with the process of eating and the disposal of waste matter. This wish in fact developed into The Flounder, which includes dozens of recipes along with half-page hymns to such ingredients as millet, lentils, and potatoes. It is not utterly absurd to imagine that Grass, had he not received the Nobel Prize, would have been equally happy with three stars from Michelin. In forty years Günter Grass has advanced far beyond Oskar Matzerath and The Tin Drum. In a variety of media unmatched by any other contemporary artist and with a seemingly inexhaustible vigor and gusto, Grass has succeeded with incessant inventiveness and without self-repetition in stamping his artistic imprint on the century that he has documented so unforgettably. Does any other writer have equal claim to the last Nobel Prize of the twentieth century? Editorial note: First published in World Literature Today 74, no. 1 (Winter 2000): 19–26.